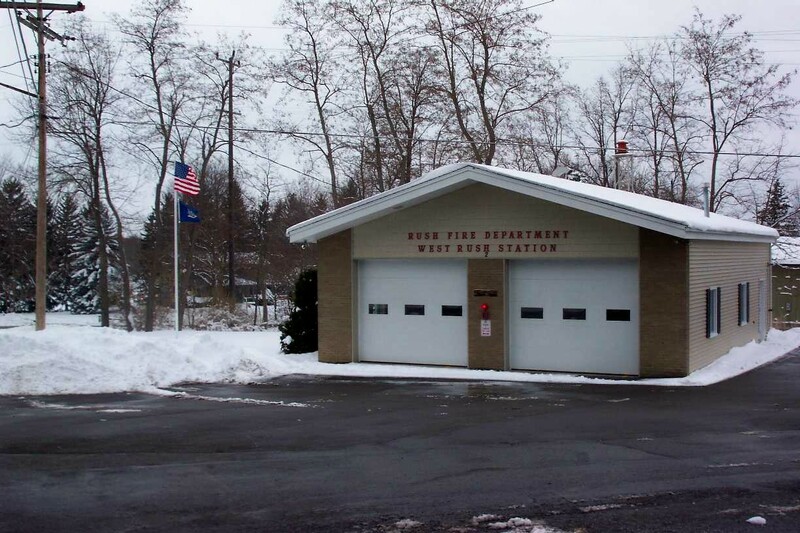 The Rush Volunteer Fire Department has been proudly serving our community since 1920. 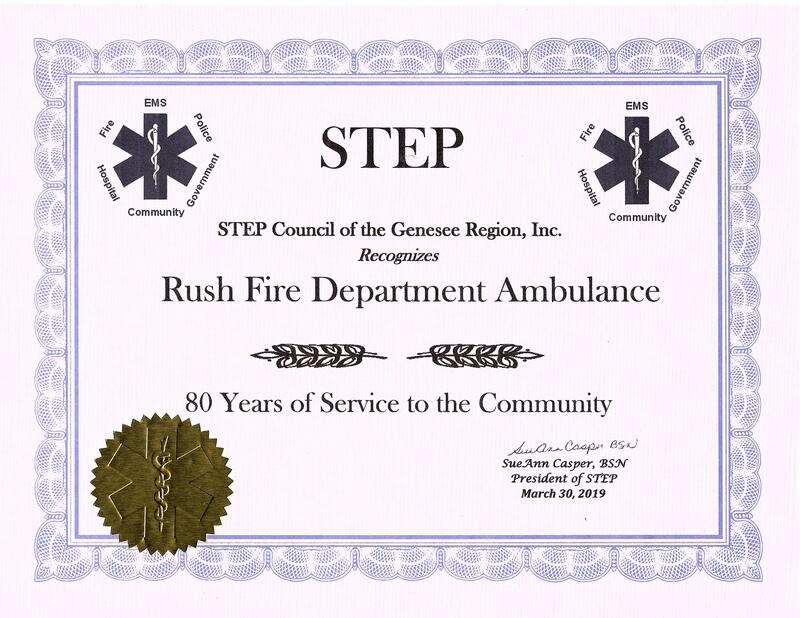 The Rush FD Ambulance Operation which started in 1939 with a Chevrolet rig that cost $790.00 was recognized at the STEP EMS Conference in Rochester on Sat. 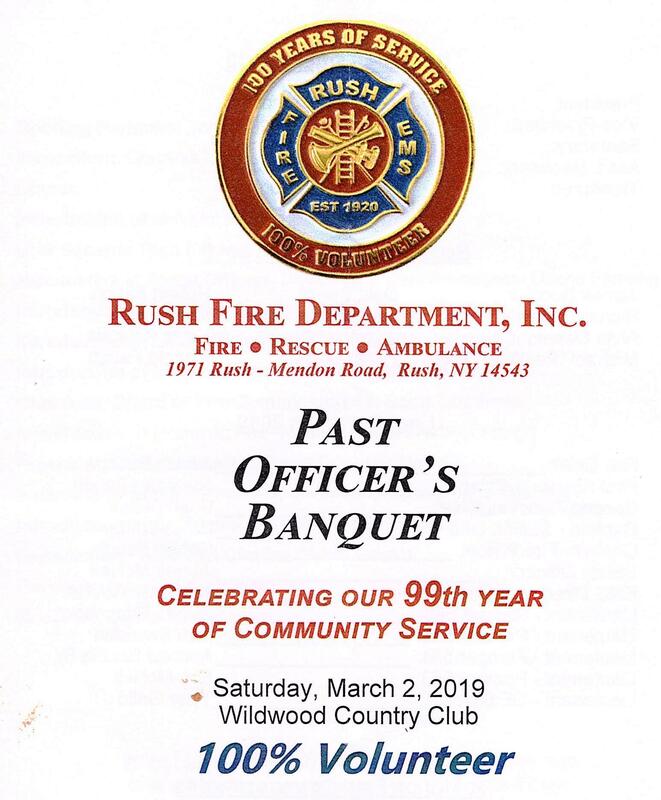 March 30 for 80 years of service to the Town of Rush. Since then FD Fund Drive money has purchased 7 ambulances at a cost of approx. $410,000. The FD Ladies Aux. has donated thousands of dollars to help equip the ambulances over the last 80 years. We were one of the 1st ambulance services to equip the unit with a phone to talk to and alert the emergency room that we were coming with a patient. We were the 1st ambulance service in western NY to transport patients to the hospital not using lights and sirens in 1972. We were the 1st FD Ambulance service in Monroe Co. to be NYS Health Department certified with an EMT on every call in 1980. There is no charge for BLS (Basic Life Support) ambulance service provided by the fire department. 102 members and guests attended the event at the Wildwood Country Club. Chief Jim Bucci Jr. was the MC and moved the program along better than ever. He thanked the members and families for the support given to the department over the years and reminded us to take care of both of our families, the fire department and the ones at home. Rush FD Chaplin “Buzz” Grimm gave the invocation and echoed what Chief Bucci had stated. A great meal was then provided by the Wildwood staff. Every member and guest received our 100 year anniversary collector coin. Rush FD Ladies Aux. President Debbie David talked about the great relationship they have with the Fire Department and gave them a $2,000 donation for anything they may need to do the job better. Over the years they have donated THOUSANDS of dollars to the fire department and ambulance operation. Rush Fire Commission Chairman Scott Goodman introduced the Commissioners thanked the members for the great work that they do and the great relationship they have with the Rush commissioners. President Duane Fanning, Chief Jim Bucci, Past Chief Jim McNeil presented the awards to those honored. Past Chief, Jim McNeil, Past Asst. Chief & Director Joe Watlack, Past Captain Ron Faugh, Past Captain Sean Brown, Past EMS DO Scott Goodman, Past Lt. Kevin Smith, Past Safety Officer Bruce Hall and Susan VanCuran for serving as Lead Explorer Post Advisor. Years of Service: Josh Eggleston (5), Kevin Kolmetz (5), Elizabeth Faugh (10), Paul Bischoping (15), Bev Smith (30), Dale Sweet (35). Past Chief & Past Commissioner Al Sweet was recognized for his 67 years of service. Past Chief Jim McNeil was given his Gold Life Membership card for 25 years at Rush. He served over 12 years at Henrietta also. 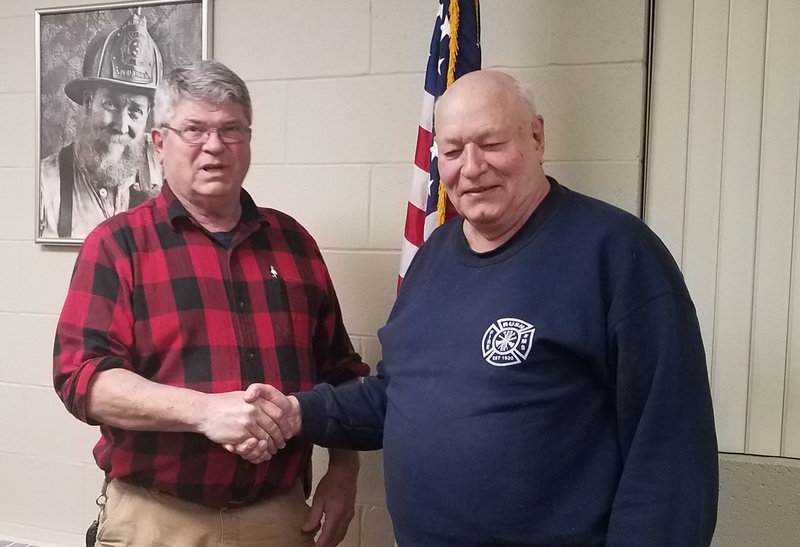 Fire Commissioner Bob Faugh presented Past Commissioner Larry Meston with a plaque & certificate from the NYS Senate for his 28 years as a Firefighter/Lieutenant/ Director and his 25 years as a Fire Commissioner. He was recognized and thanked him for his input on major purchases that the fire district has made over the years and all the time he donated keeping the apparatus in excellent condition. Many of his family members were also present, including his wife Jane. 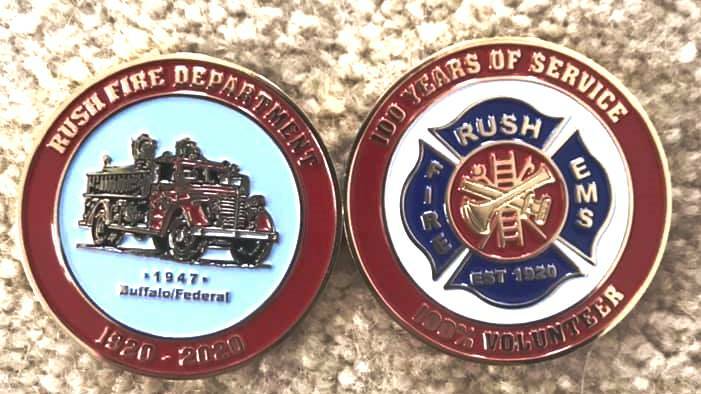 Our 100 year anniversary is in 2020 and the anniversary committee has a limited amount of fund raiser collector coins available to offset the cost of our many events for 2020. These collector coins can be obtained from some Rush firefighter including Jim Bucci, Duane Fanning, Tyler Grillo, Bob Faugh and Eric McNeil. They are $10.00 from members. If you want one in the mail its $12.00. Send a check made out to Rush FD to Treasurer Bob Faugh - PO Box 252, Rush, NY 14543. The coin is 1.75 inches across. She was selected by the over 100 members of CHS (Henrietta Ambulance) as EMT of the Year for 2018. She received this award at their annual banquet at the RIT Conference Center Saturday night February 2nd. Jenna started out in Rush as an Explore then became a Rush Firefighter/EMT. She is also the present Ambulance DO and Vice President of the Fire Department. On 3/2/19 we were notified that she was selected as "EMT FOR THE YEAR" from the Monroe-Livingston EMS Council and will receive the award at their STEP Conference March 29, 2019 in Rochester. Ambulance – ALS Required – Transported by ALS – Rush 587, 589 or F/R to the scene to assist. DECEMBERS COMMISSION MEETING: Commissioner Robert Faugh - Recognizing and congratulating Commissioner Larry Meston on his retirement from the Board of Fire Commissioners. Larry served for 25 years and was an active Rush firefighter for 28 years and is a "life member". Larry did alot of repairs on our apparatus over the years and saved the taxpayers tons of money. He also served on too many committees to list. He will be missed. 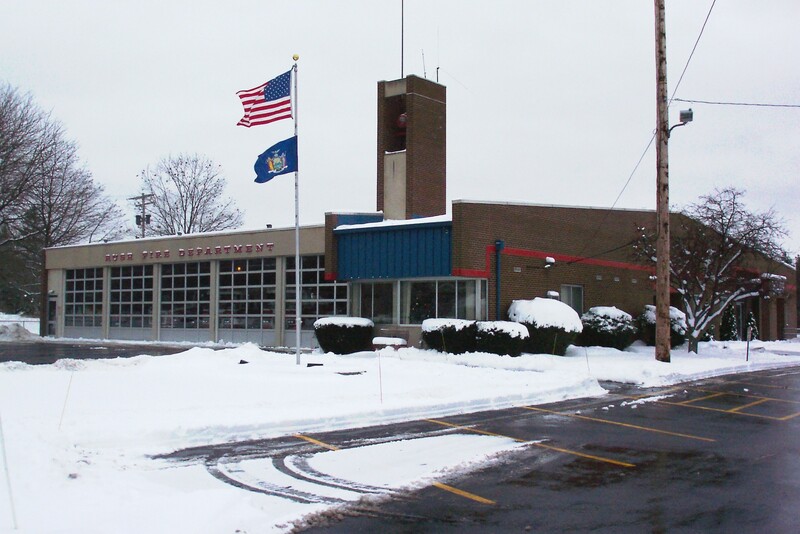 On 03/19/18 just after midnight, Rush FD Ambulance & CHS MIHC (Henrietta Ambulance) were dispatched to a report of a 68-year-old male in cardiac arrest. The caller who also performed CPR until Monroe County Sheriff Deputy Erica Henderson arrived and took over CPR within 3 minutes of the initial call to 911. EMT Jim Bucci Rush Past Fire Chief and present firefighter & Dep Chief at CHS (Henrietta Ambulance) arrived and was the first Rush responder to arrive within 7 minutes. 9-1-1 did a great job of making the proper notifies and getting help on the way quickly. Upon his arrival he confirmed a medical 500 and the Deputy continued CPR until EMT Bucci applied the pads on the patient’s chest within 53 seconds where CPR was briefly stopped so the AED (Automatic Defibulator) could analyze the patient’s heart rhythm, it was then the AED indicated a shock was warranted and then delivered. Again within 10 minutes from the time of dispatch Paramedic Manzo and Medic Byrne from CHS MIHC, arrive and at this time there was no indication of CPR needing to be done after a pulse check and airway management and patient care was underway. What saved this patient was CPR being started immediately by the patient’s wife Diana who is a current member of the Rush Fire Department adding she is an EMT and CPR instructor. The added benefit of Deputy Henderson being less than 1000’ away and was able to take over CPR and perform hi quality chest compressions until EMT Bucci arrived with his AED to provide early defibrillation. Good Prehospital care and treatment is what saved this person’s life!